Although over half the people incarcerated in America today have committed violent offenses, the focus of reformers has been almost entirely on nonviolent and drug offenses. Danielle Sered's brilliant and groundbreaking Until We Reckon steers directly and unapologetically into the question of violence, offering approaches that will help end mass incarceration and increase safety. Widely recognized as one of the leading proponents of a restorative approach to violent crime, Sered asks us to reconsider the purposes of incarceration and argues persuasively that the needs of survivors of violent crime are better met by asking people who commit violence to accept responsibility for their actions and make amends in ways that are meaningful to those they have hurt--none of which happens in the context of a criminal trial or a prison sentence. 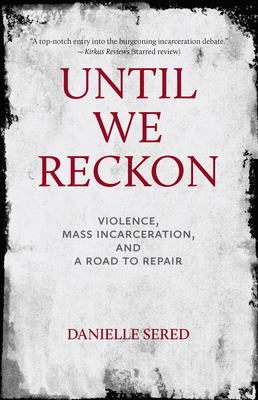 Critically, Sered argues that the reckoning owed is not only on the part of those who have committed violence, but also by our nation's overreliance on incarceration to produce safety--at great cost to communities, survivors, racial equity, and the very fabric of our democracy. Danielle Sered leads the award-winning Brooklyn-based Common Justice, which develops and advances solutions to violence that meet the needs of those harmed and advance racial equity without relying on incarceration.